Recipe adapted from America's Test Kitchen's Vegan For Everybody. [Recipe makes 2 cups]. I know, I know... It's only the second recipe on the blog, and we posted yet another recipe dealing with nutritional yeast? Yup! Guys, this stuff is amazing. 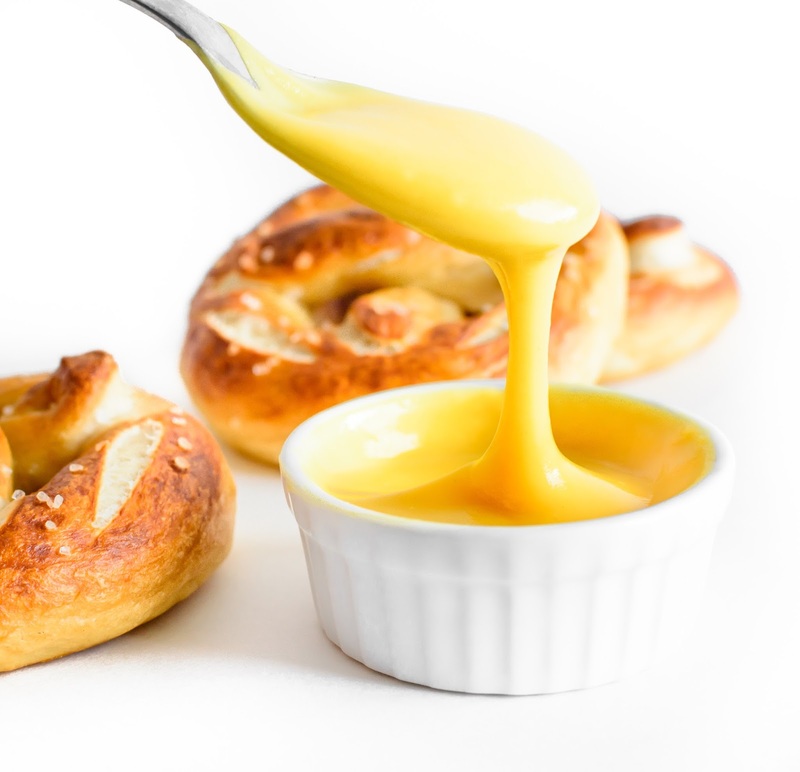 Dip some tortilla chips or freshly baked soft pretzels in it. Drizzle it over some tacos nestled in homemade flour tortillas. Or even use it as a base sauce for a taco pizza. We will warn you that this vegan cheese sauce is addictive, but that's perfectly fine, being that there's no cream, no cheese, and no chemical additives used — just vegetables and spices. Along with the taste, the concept for the recipe is pretty ingenious as well. The folks at America's Test Kitchen used science to turn potatoes into a silky cheese dip using nothing more than common knowledge about cooked potatoes. If you've ever made mashed potatoes in the food processor or KitchenAid on high-speed, you probably ended up with a gummy mess that headed straight for the garbage. This is because the pockets of starch in the potatoes were ruptured from being overworked from the blade or paddle. Because of this, we always teach people to work cooked potatoes as little as possible. But what if we do want a gooey mess? We simply do 'the unspeakable' to potatoes, and blend them on high-speed for several minutes. It sounds so weird and so wrong (we know), but the result is eerily close to Velveeta-based nacho cheese. So the next time you're looking for a perfect dip that doesn't make you feel guilty about eating seconds, reach for your potatoes, nutritional yeast, and a high-speed blender. Bring roughly 8 cups of water to a boil in a sauce pan. Add the potatoes, carrots, onions, and garlic. Reduce to a simmer, and continue cooking until the vegetables are tender, roughly 15 minutes. Drain the vegetables, making sure to save 1/4 cup of the liquid for the sauce. Add the cooked vegetables to a high-speed blender, followed by the vegetable oil, nutritional yeast, vinegar, salt, cumin, and mustard powder. Pulse 10 times, making sure to scrape down the sides of a couple of times. [Side note: The tamper that comes with most blenders will come in handy during this step]. Then blend on high speed for 2 minutes. If the sauce seems too thick for your liking, add the reserved vegetable broth, one tablespoon at a time. [Side note: Being that your blender is going to go into overdrive due to all of the starches being released from the potatoes, we strongly recommend using a high-speed blender, rather than a more basic model]. Serve immediately.